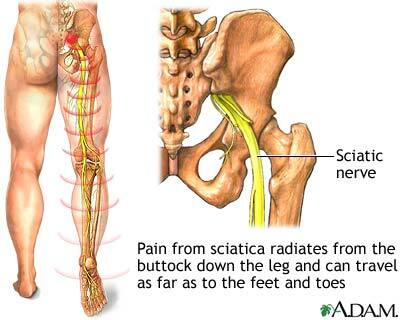 Sciatica is a term describing pain symptoms involving the lower back and radiating down the leg. The word sciatica refers to the sciatic nerve. The sciatic nerve is formed by the bundle of nerves exiting the bottom of the spinal column, and branching to the pelvis, buttocks and down the back of the leg. Sciatica implies irritation of the sciatic nerve and pain associated with the nerve’s path down the leg. Patients should be aware that the term “sciatica” is not a medical diagnosis, since many conditions can irritate the nerve. At best, it refers to the location of the pain. A through physical examination and appropriate testing by a skilled physician can determine the underlying cause of the sciatic pain. Pain that begins in the low back or buttocks and moves down the leg, and may progress into the foot. Walking, lying down and movements that extend the spine (such as shoulder lifts) may relieve symptoms. An alternative treatment for sciatica is Platelet-Rich Plasma (PRP). Platelet-rich plasma is derived from the patient’s own blood. The resulting plasma is a concentration of growth and healing factors, and is injected into the affected area. Platelet-rich plasma has been useful in a variety of tendon and ligament injuries that are resistant to normal measures of healing. If you continue to suffer with sciatica and your current treatment plan leaves you feeling hopeless, perhaps a fresh set of experienced eyes can change your outlook. Since 1990, Dennis M. Lox, M.D has applied his personal interests in sports medicine, cutting-edge regenerative medicine and chronic pain management to helping patients increase their quality of life. Contact us for an appointment at 727-462-5582 or www.drlox.com. the lower back and radiating down the leg. The word sciatica is refers to the sciatic nerve. Sciaticaimplies irritation of the sciatic nerve and pain associated with the nerve’s path down the leg.Patients should be aware that the term “sciatica” is not a medical diagnosis, since many conditions can irritate the nerve.At best, it refers to the location of the pain. A through physical examination and appropriate testing by a skilled physician can determine the underlying cause of the sciaticpain. -Pain that begins in the low back or buttocks and moves down the leg, and may progress into the foot. –Walking, lying down and movements that extend the spine (such as shoulder lifts) may relieve symptoms. If you continue to suffer with Sciatica and your current treatment plan leaves you feeling hopeless, perhaps a fresh set of experienced eyes can change your outlook.Since 1990, Dennis M. Lox, M.D has applied his personal interests in sports medicine and chronic pain management to helping patients in the Tampa Bay area increase their quality of life by reducing their pain.Contact us for an appointment at 727-462-5582.